Five new trademarks associated with Apple have been culled from the Brunei registration system, and include "A10 Fusion," "iSight Duo," "Depth," "Scribble," and "Whiteboard" marketing terms. It is not clear what the filings found by a MacRumors reader directly pertain to. While the "A10" name has been attached to the processor expected in Wednesday's "iPhone 7" release, the term "A10 Fusion" has not as of yet been mentioned in any of the rumors leading up to the "See You on Sept. 7" event. The Apple Fusion Drive is one logical drive formed by a small SSD and a conventional rotating platter hard drive. Similarly, the name "A10 Fusion" could refer to the "A10" processor and "M10" motion co-processor in tandem. Logically, "iSight Duo" could relate to the dual-lens camera system said to be in the "iPhone 7 Plus," but the rear-facing shooter is not referred to as an iSight camera —only the front-facing camera is called that. "Depth" could relate somehow to 3D Touch, or to recent patent filings about interpreting a user's motions in space. "Writeboard" and "Scribble" may have some relation to the rumored expansion of the Apple Pencil with the iPhone family. The "iSight Duo," "A10 Fusion," and "Depth" trademarks were set to be published in Brunei on Aug. 5. The "Writeboard" and "Scribble" trademarks were slated for June 29. On Tuesday, attorney Brian Conroy contacted AppleInsider with a list of trademarks that Apple is said to have filed internationally for what could be upcoming products. Amongst the trademarks are known Apple product names, like Siri, Breathe, the True Tone Display as found in the iPad Pro series, macOS Sierra with several associated spellings, and the phrase "designed by Apple in California" as seen on nearly every Apple product. 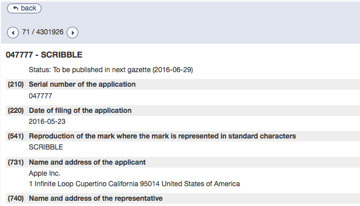 Also listed in Tuesday's Apple trademark document are other phrases not immediately identifiable. Listed by Conroy as particularly notable are a mysterious "Iris Engine" and variants, plus registrations for a "Smart Button," "Touch Bar," "Progress Card", "Swift Lab," "AirPod Case," "Control Strip," "Home Hub," and "iBooks Storytime." It remains possible that both Tuesday's discoveries, and Wednesday's Brunei trademark filings have been faked. Additionally, Apple trademarks and patents many products that may never see the light of day, or were intended to throw off investigators.